After talking about Vista so much just recently I got thinking about new gadgets that I could download and integrate into the Windows sidebar when I came across the Windows Live Gallery website (http://gallery.live.com).This particular website which has been set up by Microsoft contains literally hundreds of small pieces of software that can be used alongside a Vista installation, along with software compatible with previous versions of Windows through the Windows Live service. The Windows Sidebar is one of the new developments built into Windows Vista – it sits on the right hand side of your screen and contains ‘gadgets’ which can be best described as mini applications.Out of the box Vista contains eleven gadgets, Calendar, Clock, Contacts, CPU Meter, Currency conversion, RSS Feed Headlines, Notes, Picture Puzzle, Slide Show, Stocks, and Weather.Fortunately the community is free to develop further gadgets and this is the main interest of Windows Live Gallery as there are literally hundreds of them. eBay Sidebar Tool – This gadget allows you to keep an eye on your eBay auctions so you can view at a glance items you’re bidding on, selling or just watching. BBC News Feeder – With this gadget installed you will get news updates posted directly to your sidebar.The gadget will check for new stories every five minutes. Calculator – Does exactly what it says on the tin; this gadget will add a calculator function to the sidebar so it’s always close to hand.Also check out the ’10 in 1 conversion calculator’ gadget which allows you to convert between different units of measurement. 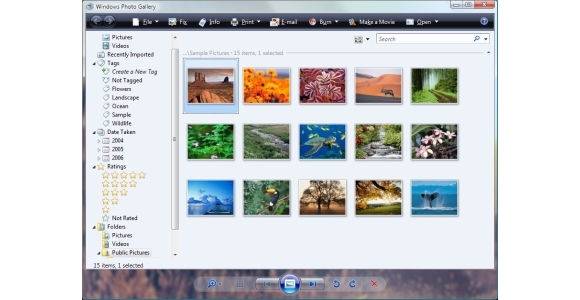 Media Player – Can be used to play media from the Windows Media Player Database, or directly from an individual file.It can also be used to play TV and Radio Internet stations directly from the Windows sidebar. Messenger Gadget – This is the gadget to install if you often use MSN Messenger as it allows you to see your contacts status, start chat sessions and change your online status all directly from the sidebar. Finding a gadget you require is made easier as they are all sorted into different categories and you can also choose to search by rating, downloads and the date added.Of course there is a lot of rubbish out there but considering how young the Operating System is, there are already a lot of good gadgets available for your Vista installation. An application that isn’t Vista exclusive is the Windows Live Messenger application and this is also supported by the Windows Live Gallery website.Online you’ll find dozens of games, add-ons and also bots, which can be easily integrated into this instant messaging application.Most of the downloads are all pretty standard stuff but one interesting resource is a list of online ‘bots’; these are automated contacts which can allows the user to get information, complete tasks or be entertained.They talk in a natural language format so you can just talk to them as you would a usual online human contact and some of them can be genuinely useful. Working our way through the website, there are a number of Windows Search items which allow includes tools for searching specific file types – for example you can download a small add-in which allows you to index all the information within a zip archive. Finally we have toolbar items which can be integrated in to Windows to offer functionality such as Wikipedia, eBay and Amazon searches directly from your Windows toolbar.If you want a laugh check out the ‘urban dictionary’ toolbar which allows you to convert urban phrases such as ‘disco nap’ and ‘epiphanot’ into proper English.